Home / Vacancy / Vacancy Announcement from Excel Development Bank Ltd. 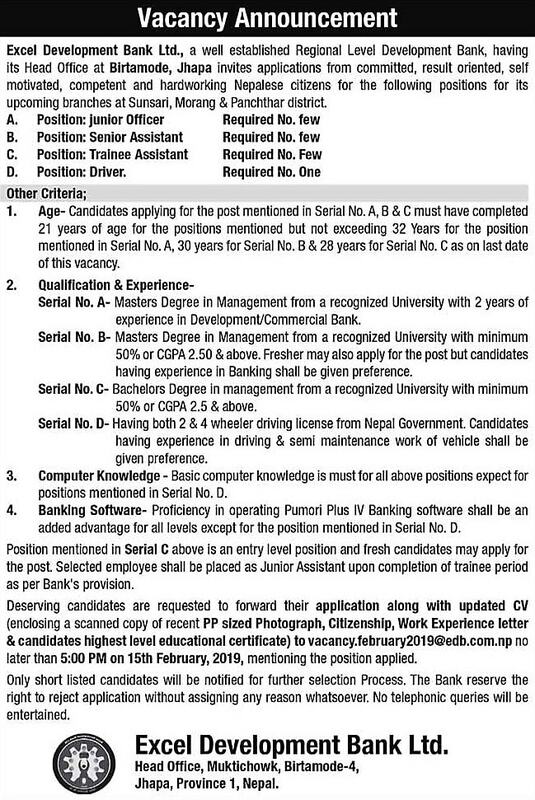 Vacancy Announcement from Excel Development Bank Ltd.
Excel Development Bank Ltd invites applications from committed, result oriented, self-motivated, competent and hardworking Nepalese citizens for the following positions for its upcoming branches at Sunsari, Morang & Panchthar district. Deserving candidates are requested to forward their application along with updated CV (enclosing a scanned copy of recent PP sized Photograph, Citizenship, Work Experience letter & candidates highest level educational certificate) to vacancy.february2019@edb.com.np no later than 5:00 PM on 15th February 2019, mentioning the position applied. Only shortlisted candidates will be notified for further selection Process. The Bank reserve the right to reject the application without assigning any reason whatsoever. No telephonic queries will be entertained.